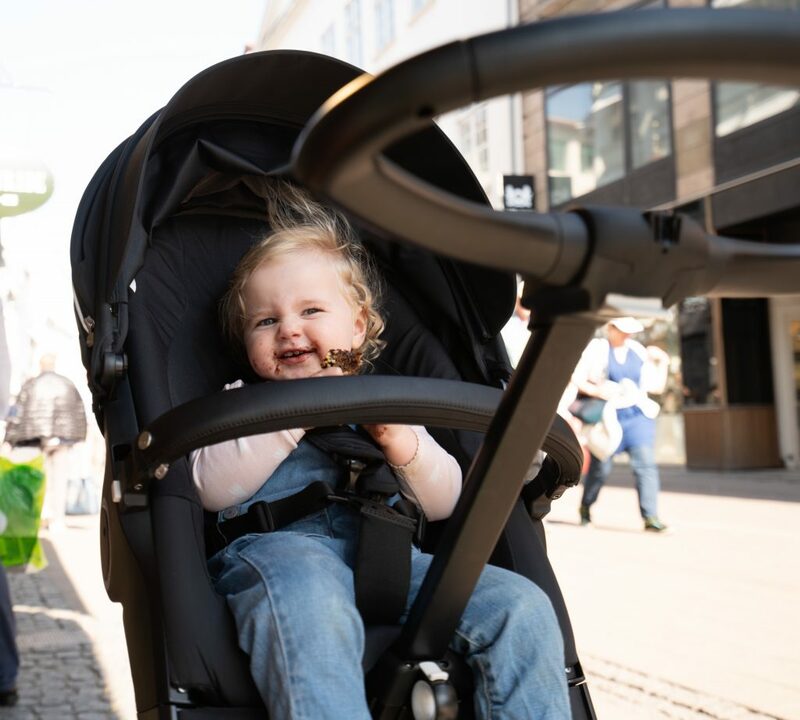 Bird’s Eye View – this is what describes the new Stokke Xplory the best: being driven around on eye level with the parent, while simultaneously being able to get a great view on your surroundings. 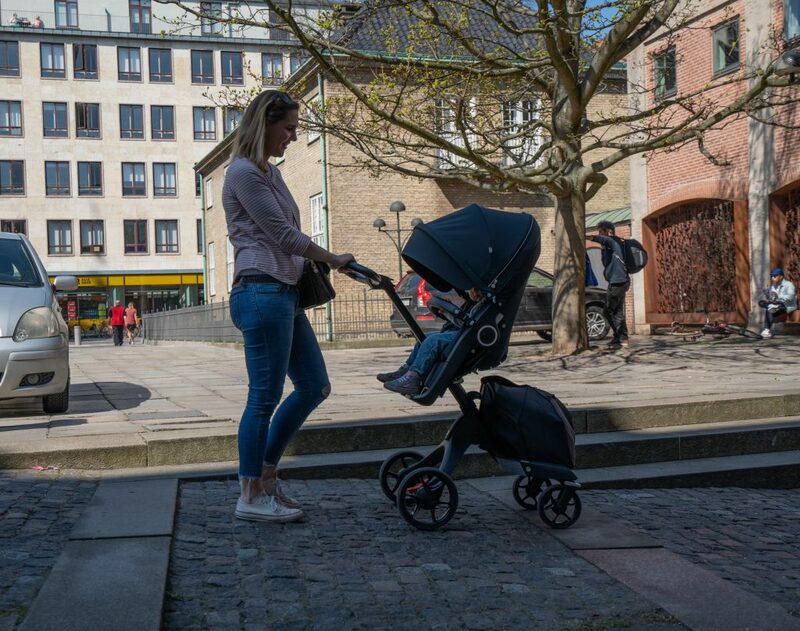 The chassis, which allows for not only extending the handlebar (amazing for tall people like my husband) but also for adjustability in height for the seat, is what sets the Stokke Xplory apart from many other prams. 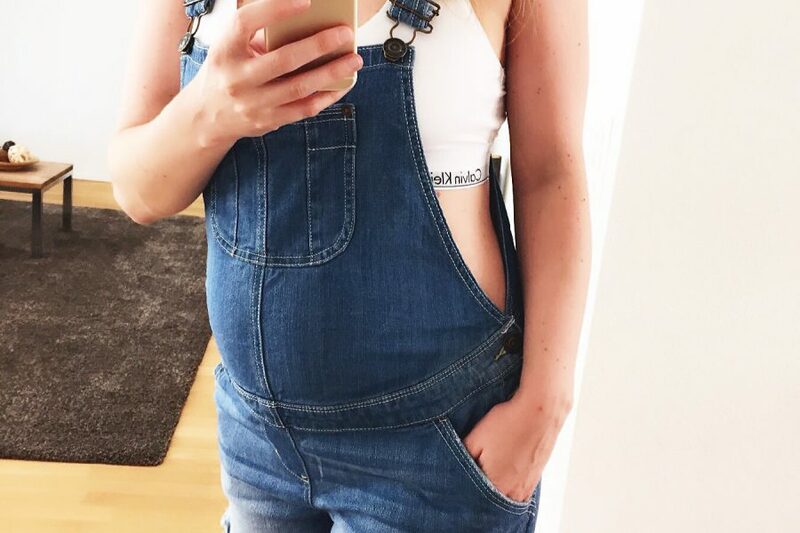 While travelling to Copenhagen we took it with us and Freja loved being able to see everything going on around her. The new version of the pram comes in a lot of different color options and you can create the pram of your dreams. 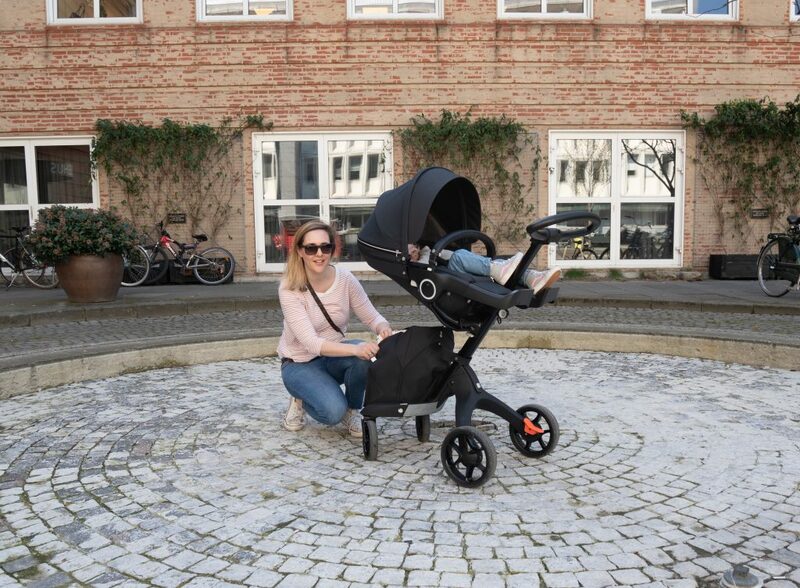 You can choose the color of the chassis (silver or black), the leather (black or brown) of the handle bars and the color of the seat and carry cot. As we like it simple we went for an all-black version and while some people might think this will be too hot in the summer: the seat comes with an extended canopy and extra ventilation (you are able to unzip part of the back to allow for extra air during those hot summer days). At first I also thought, maybe Freja is already too old for trying a new pram as she is 1 ½ years after all. 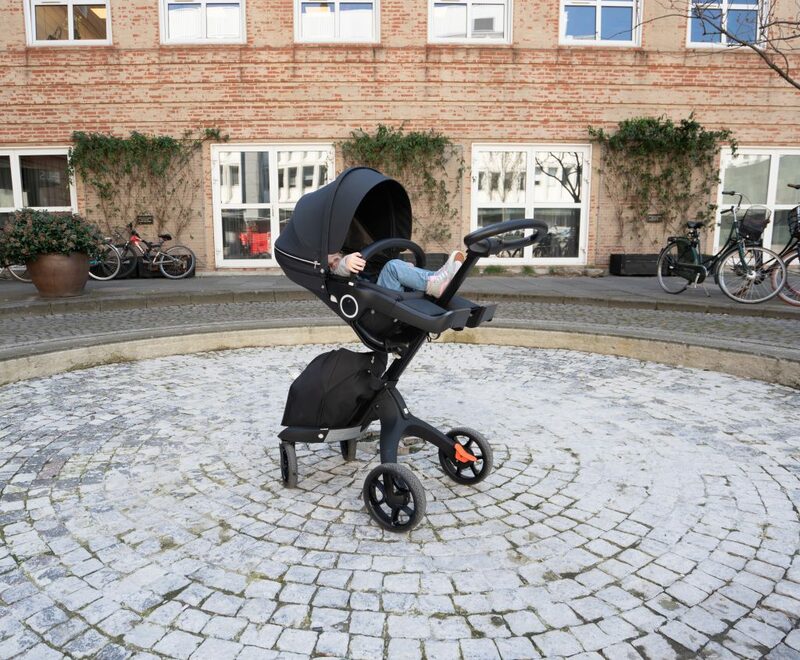 However the Stokke is actually suitable for children up to 14kg (she weighs little under 11kg at the moment). I also really liked that the seat is fully reclinable (there are three positions for sleeping and seating while facing the parent and two positions facing away from the parent) – so while we are out and about she still can take her nap in the pram if needed. Another thing that stands out with the Stokke design is the pram bag. At first I have to admit I was very hesitant about the bag, as I didn’t think it could fit that much. Turns out it fits up to 32l, and can take up to 5kg (in the pictures you can see how much we fitted into the bag, including a small changing bag, a decent-sized camera bag as well as my husband’s laptop and big woollen sweater). Really convenient is also the possibility of just taking off the entire bag with the push of two buttons which transforms the bag it into a “shopping bag to go”. 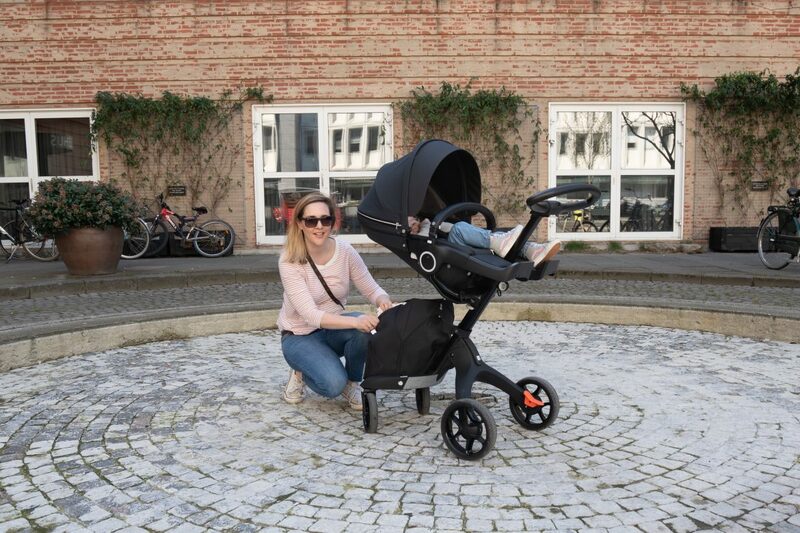 The pram consists of three parts: the chassis, the carry cot as well as the sport seat. When switching from carry cot to the seat, you just clip them on and off. No need to rebuilt and components of the carry cot in order to use the seat or vice versa. 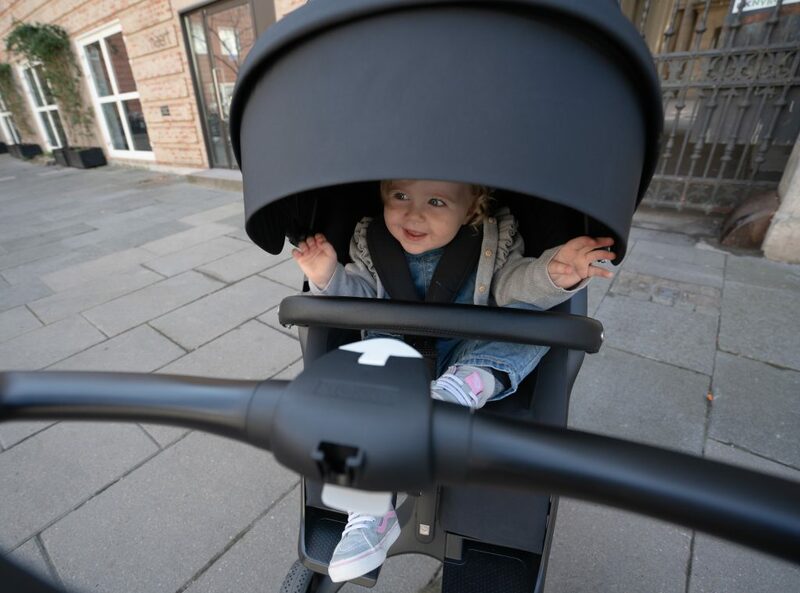 This comes really in handy for the transition period, in which you might want to still use the carry cot for longer walks when the baby should sleep in the pram and switch to the seat when quickly running errands. Or when you have a toddler and a baby and use at sling for the baby and the seat for a toddler and the next day you want to use the carry cot again for the baby to sleep inside. All the components of the pram can be taken apart/taken off and cleaned and/or washed separately. If you have ever been around a toddler you know: this will be needed eventually. The sport seat comes with a couple of nifty little extras: an extra insert for when the baby is still smaller as well as an extra padding to insert between the two leg parts of the seat to make it more comfy for the child. 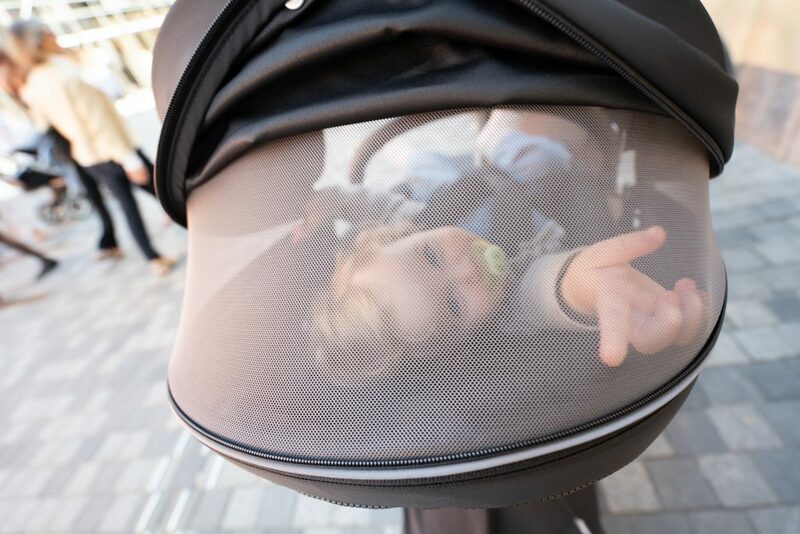 The carry cot has pockets on the outside on the side facing the parent, which is great for storing things like your wallet, keys or phone. I did however also notice, that especially the chassis is not the lightest and takes a little bit more space up in the trunk of our car due to the way it folds down. 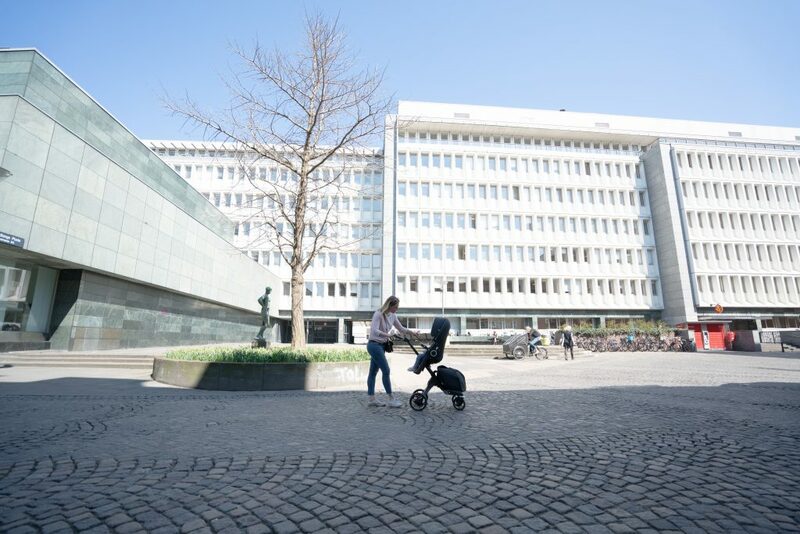 And while the Xplory is perfect for within the city – driving over cobble stone is not the easiest (however there is the Stokke Trailz for the ones among you who like to venture off-road). Overall I was very impressed by the Stokke and also Freja loves sitting in it being driven around. Pictures taken by my talented brother-in-law. Check out his portfolio here. Advertisement: the high chair was kindly given to us by Stokke via PPR Media Relations AG. I was however not paid for this post and my opinion is completely my own.